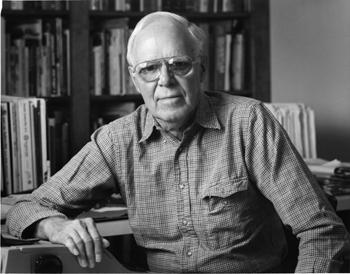 American man of letters and numbers Martin Gardner was born 100 years ago, on 21 October 1914. Of the hundred or so books he left us, more than half are about mathematics and physics in some form. For over fifty years he championed puzzles and recreational mathematics, most famously in the Scientific American column he wrote regularly from 1957 to 1981. He's deservedly credited with turning on several generations of people worldwide to the pleasures of maths and creative problem solving in general. Martin Gardner. Image courtesy James Gardner. "The best way, it has always seemed to me, to make mathematics interesting to students and laymen is to approach it in a spirit of play. Surely the best way to wake up a student is to present him with an intriguing mathematical game, puzzle, magic trick, joke, paradox, model, limerick, or any of a score of other things that dull teachers tend to avoid because they seem frivolous. The frivolity keeps the reader alert. The seriousness makes the play worthwhile. [The reader] may be surprised by the amount of nontrivial mathematics he has absorbed without even trying." 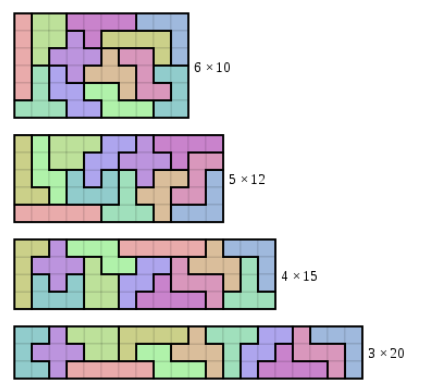 Here we present five examples of puzzles popularised or suggested by Martin Gardner which hint at deeper mathematics, in some cases giving rise to still open questions. They all involve squares or cubes. It's a testament to his considerable output and influence that we could just as well have done a similar exposition of items on triangles, or circles, and their three dimensional incarnations, or a dozen other topics not even related to geometry. It's an easy exercise to show that if two opposite squares are removed from a square 8x8 board, as shown, then it's impossible to cover the remaining 62 squares with two dominoes which are each the size of two squares (see here). This problem was proposed by Max Black in 1946, and Gardner wrote about it in his February 1957 Scientific American column. It's in Chapter 3 of the first Scientific American spin-off book, now available in revised form as Hexaflexagons, probability paradoxes, and the Tower of Hanoi and also on page 2 of My best mathematical and logic puzzles. It's equally impossible to cover the board if any two squares of the same colour are removed. But what if two squares of opposite colour are removed? This question is less well known. Gomory's Theorem (1973): An 8x8 board of squares which has 2 squares removed can be covered by 31 two-square dominoes if and only if the removed squares have opposite colours. Can you complete the proof? We've done the easy bit for you! Can you generalise the statement? Surely something similar holds for boards of other sizes? What about differently shaped dominoes? "A good puzzle lasts for thousands of years. Martin had very good taste, and hoovered up much of the best material. So his work is a treasure trove of really neat ideas." Ian Stewart, mathematician and author. If any one unit square is removed from a 2nx2n board, then what remains can be tiled with L-shaped trominoes. A simple proof is linked from this Wikipedia page on trominoes. Gardner himself published Tiling the bent tromino with n congruent shapes in the Journal of Recreational Mathematics (1990), and L-tromino tiling of mutilated chessboards in the College Mathematics Journal (2009). 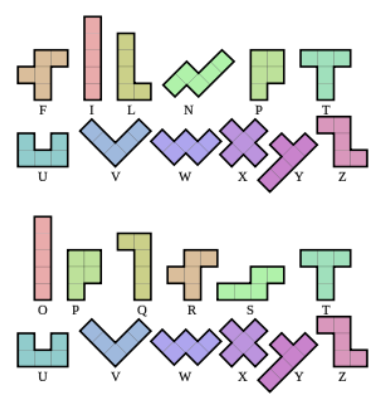 There are five tetrominoes: shapes formed by gluing together four squares, and you can read about how they attracted the attention of Ron Graham [discoverer of our favourite number] in the article Tiling a square with tetrominoes on Alex Bogomolny's excellent Cut the Knot site. This also links to a journal showing the twelve ways to tile an 8x8 board with L shaped tetrominoes, published in 1979 by George Jellis of Warickshire. Once we get to pentominoes, shapes formed by gluing together five squares, things get much more complicated. Gardner wrote about these creations of Golomb's in Scientific American in December 1957, now available as Chapter 13 of the first spin-off book. Since they have a combined area of 12 x 5 = 60 units, and 60 has five interesting factorisations, several tiling challenges suggest themselves. 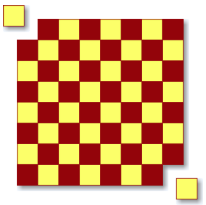 There's no hope of tiling a 2x30 grid with all twelve pentominoes, but a 3x20 one can be tiled in two (related) ways with them, one of which is shown in the last row below. The picture shows single solutions for the other factorisations of 60, in each case there are a great many other possibilities. For instance, in 1960 Colin Brian and Jenifer Haselgrove found over 2000 in the 6×10 case. This is just the tip of the iceberg, a huge literature has evolved analysing the properties of pentominoes. Back in the early days Golomb proposed a two-person game played with all twelve pentominoes on an 8x8 board. As recently as 1996, Hilarie K. Orman came up a search-based computer proof that the first player wins (see the paper Pentominoes: A first player win). Generalising from 5 to n for the number of squares glued together brings us to polyominoes, and it turns out that even counting how many there are is very difficult. How many are there, say of size 100? We just don't know. So far, we've considered two dimensional grids and tiles, which can be thought of as pixelated jigsaw puzzles. What happens if we add a new dimension? The Soma cube is arguably the first interesting case we get, a kind of 3x3x3 jigsaw puzzle, and what an interesting case it is! The building blocks are seven glued assemblies of three or four unit cubes, which are examples of polycubes, as shown on the left below. The first goal is to combine them to yield the 3x3x3 cube on the right. Not only is it possible, but thanks to English mathematicians Richard K. Guy and John H. Conway, we've long known that it can be done in 240 different ways. The Soma cube was invented by Gardner's friend Piet Hein, apparently in 1933, and Gardner's September 1958 Scientific American column popularised it for a wide audience. That article is Chapter 6 of the second Scientific American spin-off book, now available in revised form as Origami, Eleusis, and the Soma Cube. The Soma cube and its constituent pieces can and have been extended in various directions. Martin wrote about some of these generalisations too, and many interesting developments are surveyed here. This is The papered cube problem, also found (with an extensive discussion) in Chapter 5 of Gardner's later Scientific American spin-off book Mathematical magic show. Note that while the pattern used to wrap the cube here is in one piece, other parts of the original 3x3 grid may have been jettisoned. One certainly wonders if a unit cube can be accommodated. Which brings us neatly to a terrific recent question available in Russian at Mathematical Etudes, and in English as Wrapping the cube at the Cut the Knot Insights blog. Whatever you do, don't look at the solution there until you try it for yourself! "Martin Gardner has inspired at least two generations of mathematicians, and he could inspire another generation if only they were aware of his brilliant and intriguing writing." Simon Singh, author. It asks if it's possible to cut and fold a 3x3 square grid of paper to enclose a 1x1x1 cube, as shown above, subject to two conditions: the cutting and folding must be along existing grid lines, and the resulting piece of paper must be connected. This rules out both crude no-rules upward folding to try and get the eight squares surrounding the cube to wrap up and totally enclose it, and simply hacking the grid into nine unit squares and using six of them to attach to the cube faces. Let’s return to Martin’s Papered cube question from above. The answer depends on whether the overlapping of paper is allowed. If it isn’t, one can accommodate a cube of side length which is about 1.061, a slight improvement on the (successful) attempt to enclose a unit cube from earlier. But what if overlapping is okay? While not originally anticipated by Gardner when he proposed the question, several readers wrote to alert him to the fact that there is then a way to use as much of the paper as one wishes, at least theoretically, to approach the limiting case of a cube of side length , which is about 1.225. All of the solutions alluded to here (literally) have four-fold symmetry. In 1990 Gardner asked the following question in a short piece he wrote for the Dutch magazine Cubism for Fun. It's the first item in his book A Gardner's workout. What is the minimal area of surfaces inside a transparent cube that will render it opaque? In essence, he was asking for a system of "walls" inside a cube, of minimal total surface area, so that if the cube's six exterior flat walls were transparent, the interior walls would block all linear light rays passing through the cube. It's tempting to try some "diagonal" walls inside the cube to block all light from passing through, but it turns out we can do better than that. What is the minimal length of curves inside a transparent square that will render it opaque? This time we seek a system of "walls" inside a square, of minimal total length, so that if the square's four exterior straight walls were transparent, the interior walls would block the path of all linear light rays passing through the square in the plane. Simply erecting blocking walls along all four exterior walls — actually just three is fine — does the trick, but is very wasteful. The most obvious "diagonal" interior blocking walls one could erect inside the square are shown on the left below, with total length which is about 2.83 for a unit square. This can be improved on by introducing two Steiner points, yielding the picture on the right above, with total length about 2.73. (You can find out more about Steiner points here.) While the Steiner tree of interior "walls" shown there forms the shortest network connecting the four corners of the square, and all light is blocked from passing through as desired, it turns out that we can do better. The best known opaque square has light blocked by a very surprising network of interior walls with total length . See if you can imagine what it might look like before you view Ken Brakke's picture of it here. Even more surprising is that this is merely the best known solution; it has never been proved to be optimal. The Brakke image, literally, leaves the door open to the possibility of future improvement. The corresponding problem for an equilateral triangle is also unresolved. These are special cases of a family of two dimensional opaque forest problems. Given how difficult the two dimensional problem turns out to be, it's hardly surprising that little progress had been made on the three dimensional version which Martin posed in 1990. 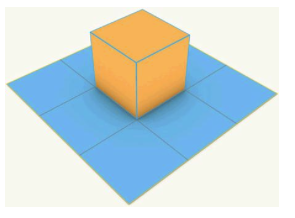 Ken Brakke (famous for the surface evolver program for modelling liquid surfaces) made the above two images, which show successive attempts at solutions for the cube problem. Like the square images from a little earlier, they can be found in his paper The opaque cube problem. There he raises the fascinating possibility that such an optimal surface may not even exist. The image on the left, he reports, shows "the result of making a vertical cylinder above the 2D solution, putting squares on the top and bottom, and letting it evolve in my surface evolver to decrease area. Its area wound up as 4.2342." The image on the right, by contrast, "has a three-fold symmetric tunnel through the middle instead of a two-fold symmetric tunnel, and its area is slightly better at 4.2324." These results from the early 1990s have yet to be improved on. That's a great example of how a simple, innocent sounding question can spur new mathematics, sometimes with very surprising (indeed, inconclusive) consequences. Dubliner Colm Mulcahy is Professor of Mathematics at Spelman College in Atlanta, Georgia. 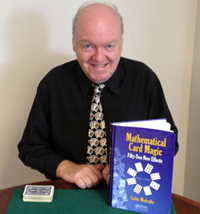 He recently published a book of mostly original mathematical card magic principles, Mathematical card magic: Fifty-two new effects. He had the good fortune to know Martin Gardner for the last decade of his life.